Morning dose of red white and blue (and green and brown)! The rust-red icicle bridge. To say it waits for us each morning would be a lie. 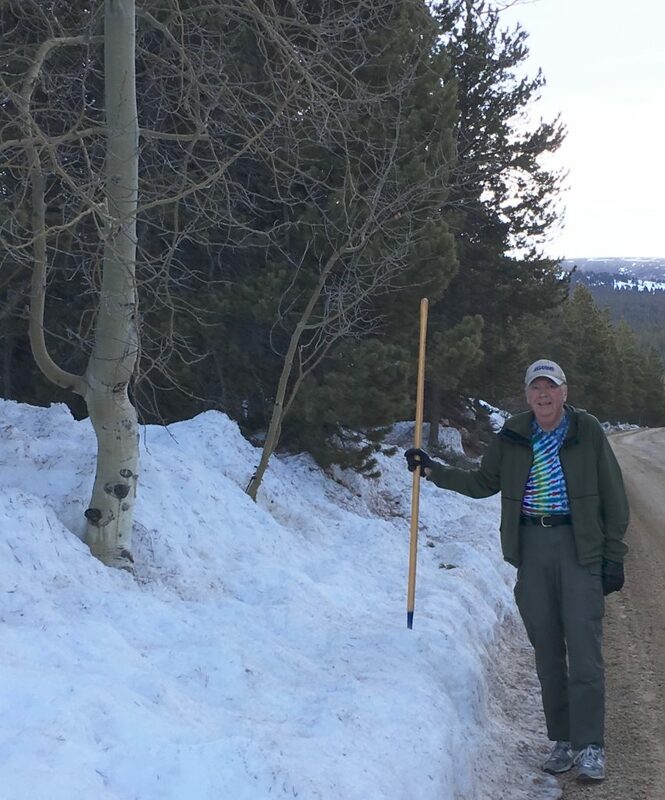 It’s just a tree, an aspen tree with a tuning fork trunk. But no. It’s more than just a tree. It’s a goal, a symbol, a reward. Several years ago I invaded my neighbor’s exercise routine by inserting myself and my dog into his morning walk. Since that first hike up the east side of our little town, I’ve come to look forward to rising earlier than I would otherwise rise to get my morning dose of inspiration, and John has grown used to Ranger’s initial excited barking at him and my often incessant chatter. I remember asking that first morning how far up the moderately steep road we’d go before turning around. “Where the road turns to dirt, there’s a tree,” John told me, and I couldn’t wait for the pavement to end. It’s hard enough to breathe some days doing routine tasks at 10,200’ elevation, and before we approached the rust-red bridge, moderate turned to steep. The pavement didn’t stop, but my chatter did. Beyond the bridge was yet another cruel incline. I was really out of speed-walking shape and thought we’d never reach the turn-around spot, but when I saw the tree just beyond where the pavement ended, elation replaced fatigue. John “Orville” Stewart at the turn-around tree. Don’t let anyone know he owns a tie-dye T-shirt! Years have passed since my first quest to reach the turn-around tree, and not a single walk has culminated without some fresh insight about my life and my writing. In 2015 while searching for the perfect name for the flying frog character in my novel Waterwight, I asked John if he had a middle name. After a moment’s hesitation, he told me. John laughed, and my character had his name. 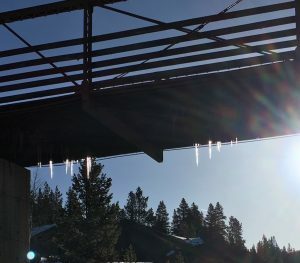 Icicles form under the “bridge of doom”! Countless encounters with people and the landscape during our routine walk (which never seems to get much easier for some reason) have inspired scenes and new characters and plot twists for my writing. Walking under the bridge, for example, with its menacing icicles from sunny morning thaws gave me the vision of Orville’s underwater rescue of Celeste. A young boy named Bridger who told me his superpower would be “to build things” inspired the character Bridger. An arrow stuck in a telephone pole inspired John to suggest an archer character (yes, I have dragged John into my fictional worlds), and when I let him get a word in edgewise, he often provides me with ideas to ponder. “Have you noticed the profile on Mt. Massive?” he asked one morning after we discussed shapes of clouds and already-named stone formations like New Hampshire’s Old Man of the Mountain. When I told him no, he directed my attention to a stony outcropping halfway down from the highest crest of Mt. Massive, the gorgeous mountain range sprawled before us, waiting for us, I imagine, on our descent from the east side each morning. And not only was Old Man Massive born that day, but the stark outline of mountain against crystal blue sky inspired a vision of the precipice scene for Waterwight. I have yet to publish a young children’s book, but I have titles for them on my list. Perhaps “The Turn-Around Tree” will end up as more than simply this blog post title. While the time it takes us to reach the turn-around tree never seems to vary much despite our noticeable improvement in fitness, the time itself has grown in value. Some mornings it’s filled with chatter (until that last steep spot) about the world and life and the latest local happenings, but more often now there are longer stretches of silence in which to create new worlds. The turn-around tree is an achievable goal, one that starts each new day with a discrete accomplishment. It’s a symbol now too, of something that continues to grow—like friendship—its tuning fork shape a reminder to stop the chatter every now and then and listen. And it’s a reward, ever-changing in its ability to endure its often harsh surroundings, a visual treat marking our success, there for us as a reminder to consider the turning places in our own lives. I’ll pretend the turn-around tree does wait for us each morning. The idea might keep me from sending a “too tired today” text on mornings when my warm sheets encourage my bed potato tendencies. And who knows. “The Turn-Around Tree” just might make it to the top of my children’s book title list. I can visualize at least one story ready to be shaken from its branches . . . yet another reward waiting to be claimed. Previous PostWhat’s the Best GPS for Hunting?Next PostHunting and Love? Thank you for this offering. It definitely put a smile on my face for not only the thanks for my modest contributions to your writings, but especially for describing our morning ordea…, er, excursions in such a delightful manner. Ha! Your contributions have been more than modest. Someday . . . when I find I need to share my millions . . . I may be able to compensate you! Oh, yes: The tie-dye shirt. I always tell my friends, “No (Christmas or birthday) presents.” So what happens? I don’t remember (not a big surprise) you telling me that your walking buddy might be a relative of mine! Where is John originally from and does he have any relatives in Iowa? It does sound like you’ve found your muse. Love you bunches and big hugs to Mike and Jake ???? Not a blood relative, but we’ve adopted him into the family! Will do, and hugs back at all the other Stewarts in the family! As John’s youngest brother I can easily state that he’s always been an inspiration to me. Thanks for this post! Keep it up you two! Thank you, Scott! He continues to inspire many, including me!